Exactly a quarter century ago, on October 26, 1985, Marty McFly traveled back in time thirty years in Back to the Future. 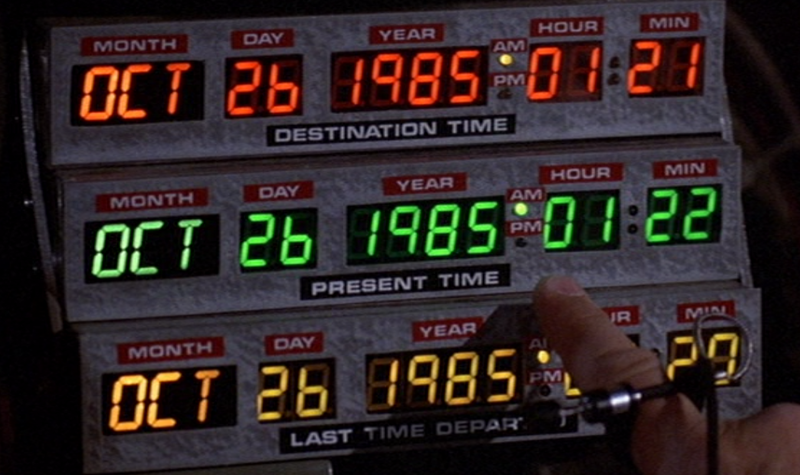 The film and the concept of time travel captured my imagination as a kid and continue to fascinate me today. While the Back to the Future trilogy is entertaining, I enjoyed most anything with a time twist or space time continuum plot line including the late 80’s TV sitcom Out Of This World (starring a girl named Evie who could stop time by touching the tips of her index fingers), the Bill Murray film Groundhog Day and various X-Men comic storylines. Heck, I even remember liking the 1994 Jean Claude Van Damme movie Timecop. More recently, I appreciated both the “time turner” action in Harry Potter, the vastly underrated Meet the Robinsons and who doesn’t love Hiro Nakamura? But what is it about playing with time that is so enthralling? Nearly a decade ago while attending Pepperdine University, I was introduced to Redemptive Cinema and the concept that anything worth watching is usually enjoyable due to some underlying theology supporting the plot and characters. So what might our interest in Back to the Future or the rest of the time related plots above teach us about the nature of God? This excerpt nicely illustrates that in accepting God’s own description of Himself as Light, it follows we should have no issue with believing God exists outside of time as we know it; opening up a world of possibilities and explanations regarding Biblical texts. For example, in Exodus 3:14-15, when asked to give His name, “God said to Moses, “I AM WHO I AM”; and He said, “Thus you shall say to the sons of Israel, ‘I AM has sent me to you.’” God, furthermore, said to Moses, “Thus you shall say to the sons of Israel, ‘The LORD, the God of your fathers, the God of Abraham, the God of Isaac, and the God of Jacob, has sent me to you.’ This is My name forever, and this is My memorial-name to all generations.” There is a lot going on in this interaction, but for our purposes, the text appears to indicate an omnipresent God throughout time. Now, neither myself nor Ms. Silko are scientists, and this is not meant to be a scientific paper, but what she noted appears to fit with an omnipresent Creator who weaves Himself consistently through the fabric of the human narrative. In fact, all four gospels are written in the present tense in the original Greek. According to the New American Standard Bible’s Principles of Translation notes, it was believed the “Greek authors frequently used the present tense for the sake of heightened vividness, thereby transporting their readers in imagination to the actual scene at the time of occurrence. However, the translators felt that it would be wise to change these historical presents to English past tenses.” What if, more than a stylistic language choice, the text itself is also attempting to point toward the ever present nature of God, as if Jesus didn’t just say things to his disciples, but that he perhaps literally continues to say them to us today (“and He says to him, Follow Me!” Matthew 9:9). So God is present, which is comforting, but does he have a sense of past or future? Going back to the concept of God as light, we can know that God amazingly exists outside of time, while simultaneously He is present in all of it. This is where my mind is blown in an attempt to understand His greatness. A God who can see both the future and past while being fully present in this moment, means we have One who is capable of doing some incredible things on our behalf and we see often see this in answered prayers. I suspect most Christians believe God will hear our prayers for the present moment and that on occasion He answers immediately, and that they also believe God hears and grants petitions in regard to the future. But for a God who exists outside of time, and is somehow still fully present in the past, is it improbable that we might be able to pray into the past and that He would still grant our requests? I don’t imagine God may alter the past significantly enough based on our prayer to change the course of human history, as timing is His business, but might it be possible to pray for deceased loved ones that God may give them an extra sense of peace during a moment of particular crisis during their life now expired life on earth? This doesn’t seem any less plausible to me than the idea of having visions of the future (and if you doubt that glimpses of the future can be given, please feel free to explain the phenomenon of déjà vu). In the grand scope of the Biblical narrative, it appears God through Jesus and the Spirit is moving forward with the restoration and reconciliation of Shalom, or the way things were created to be interdependently “good”. Only now when humans again arrive in the Garden of Paradise, we will find ourselves matured and more beautiful for having grown through adversity and for being purchased back by Christ’s blood. So in one sense, we are all being restored and are headed back to where things began, but in another, Heaven will be an entirely new creation and a place we’ve never been. Seemingly time is moving backward and forward simultaneously. A God who exists simultaneously outside of time and is present with us in each moment? A God who can answer prayers for the future and the past? A God who is working forward into the future to create a new reality and yet restore an original design? A God who will work backwards to turn agony into glory? Great Scott! That’s some heavy stuff, eh Marty?